sycamore stirrings: My husband is in love . . .
My husband is in love . . .
with Barack Obama. Maybe not in love, in love, but there is definitely something going on. It all started when he attended the caucus training last weekend. He left the house in a hurry and returned with a sparkle in his eye and a mandate on his mind. He told me he wanted everyone to know and that yard signs were NOT out of the question. 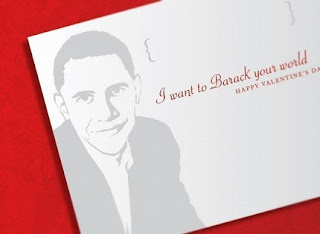 So, as a show of support, I decided to give him this card for Valentine's Day. I'm pretty sure it'll get his attention. It is made by Alcove Press and I found it on Etsy (of course). That is hilarious! could bryce be any more endearing? Very cute!! I'm kind of an Obama fan myself. Oh my gosh, laughing so hard. We actually had an extended conversation with our Kenyan cab driver the other night. That so many people can feel so passionate about him is pretty astonishing.